Scanning probes, i.e. devices having at least a tip of nanometre sized dimensions that scans or moves over an object surface, typically at a distance of a few angstroms or nanometres, monitoring some interaction between the tip and the surface, e.g. monitoring the generation of a tunnelling current. 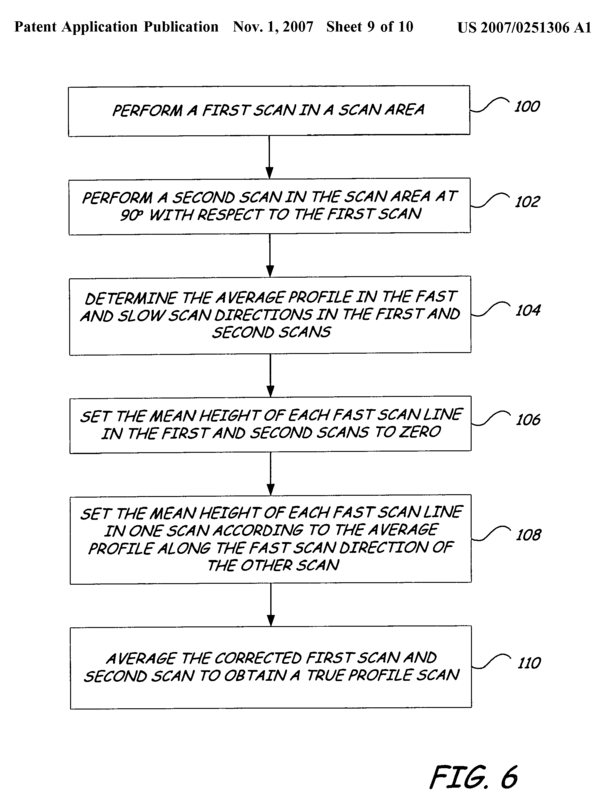 Techniques or apparatus involving the use of scanning probes. 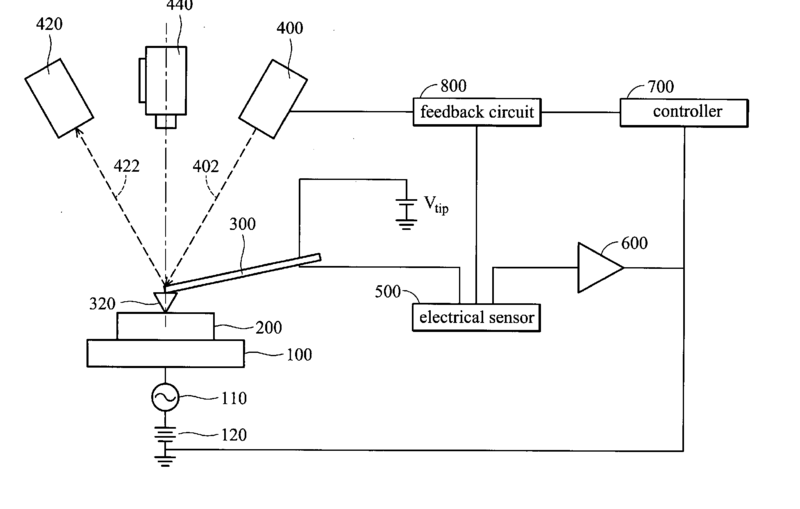 scanning probes per se, their manufacture or their related instrumentation, e.g. holders. 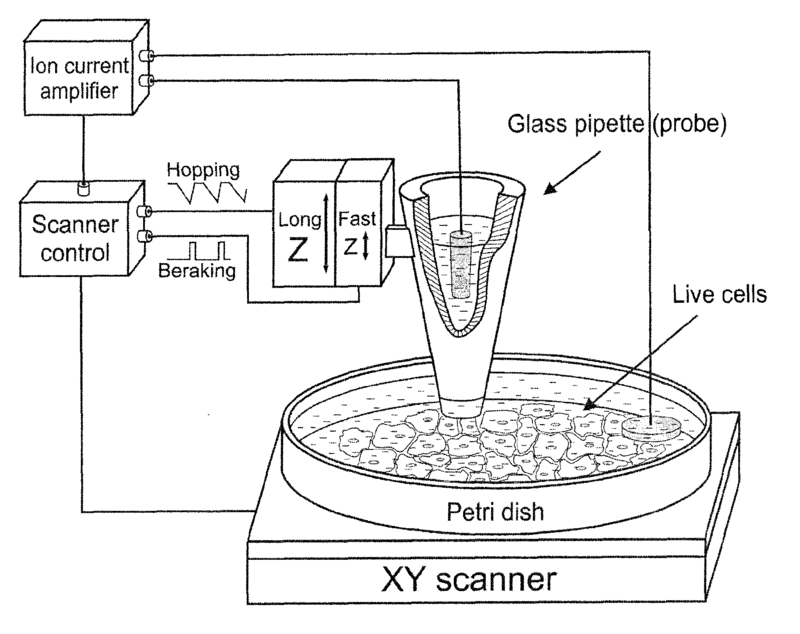 scanning-probe microscopy (SPM) or microscopes, i.e. the application of scanning probes to the investigation or analysis of a surface structure in atomic ranges. 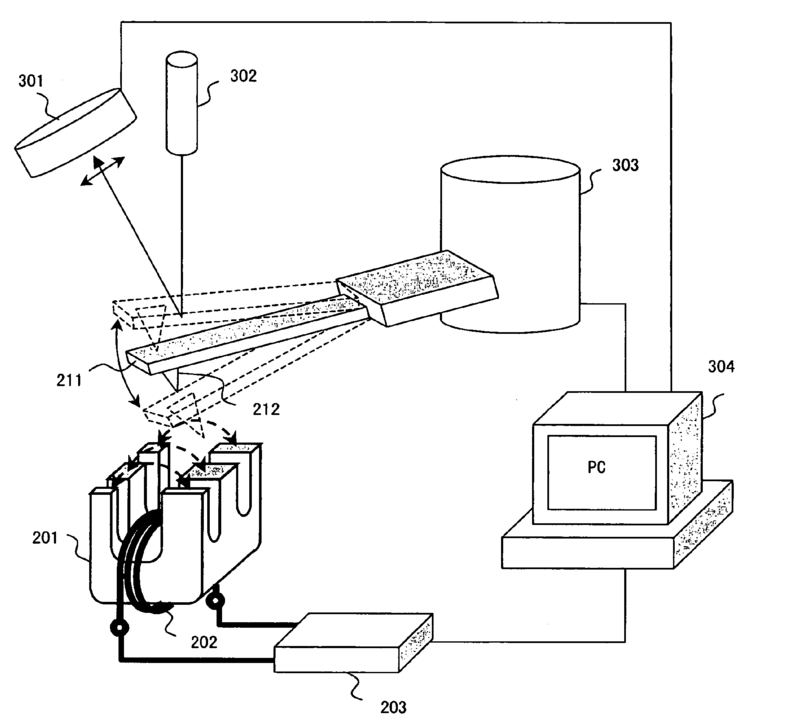 applications, other than SPM, involving the use of scanning probes. In this subclass, the first place priority rule is applied, i.e. at each hierarchical level, classification is made in the first appropriate place. 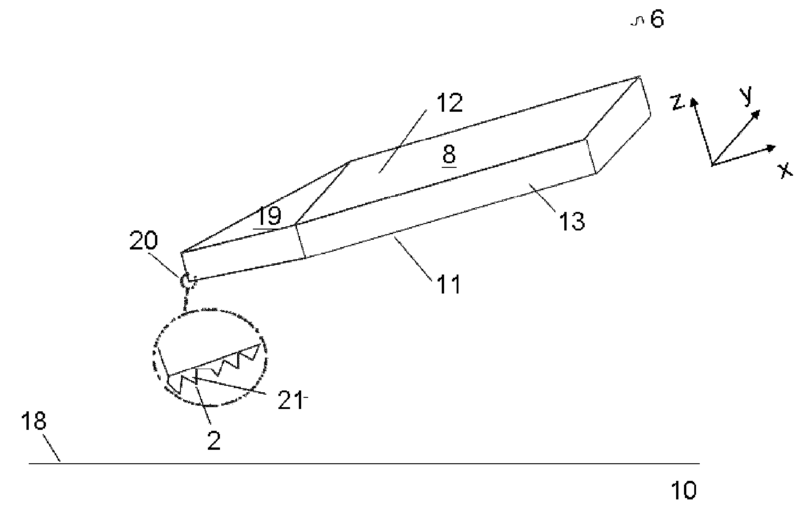 Actively controlling the movement or the location of the scanning probe tip relative to the object surface. 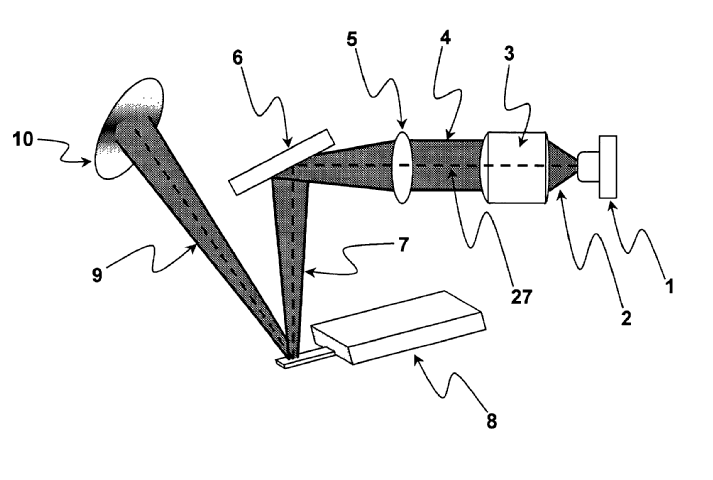 Generating movement of the scanning probe tip relative to the object surface at a scale larger than the resolution of the scanning probe microscope. 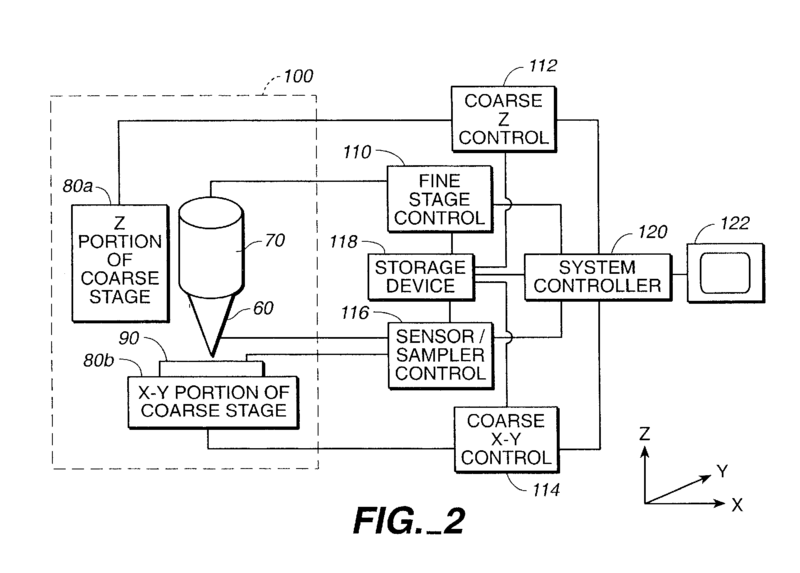 Coarse scanning or positioning means are at least partially mechanical. 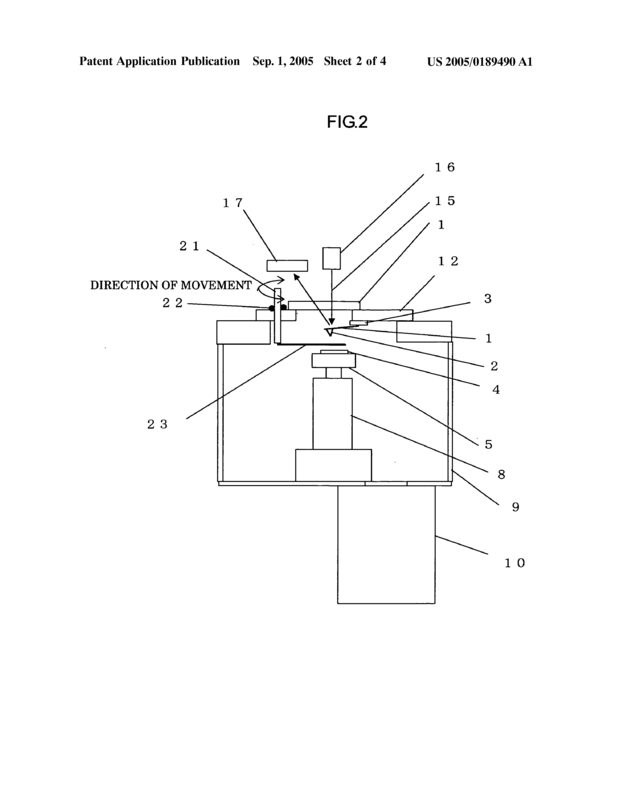 Generating movement of the scanning probe tip relative to the object surface of a size comparable to the resolution of the scanning probe microscope. Fine scanning. 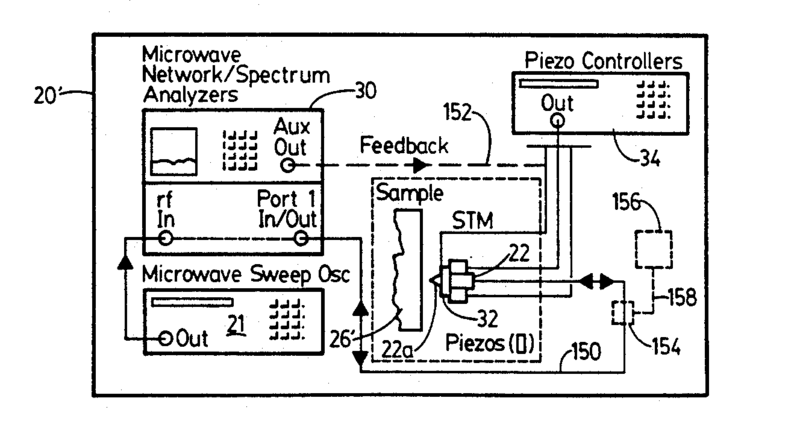 Piezoelectrical scanning or positioning means are classified in this group. 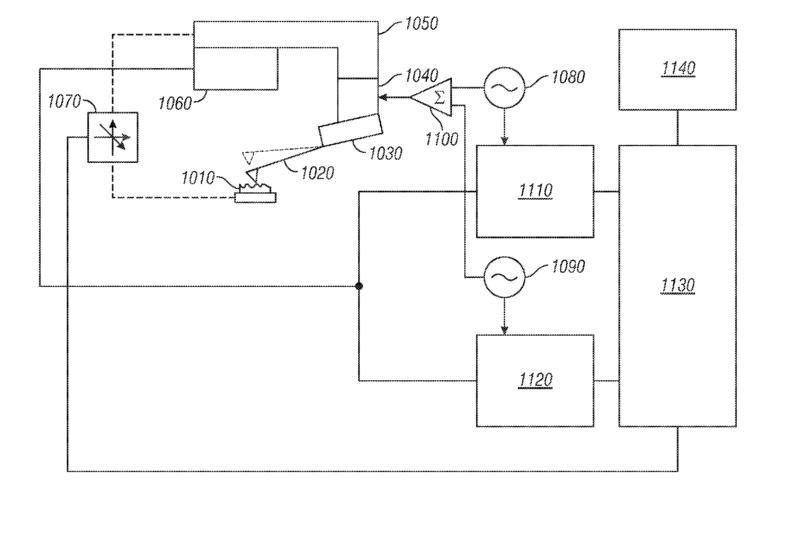 Illustrative example of subject matter classified in this group: US6422069. Electronic means for locating or stabilizing the movement of the scanning probe tip relative to the object surface. 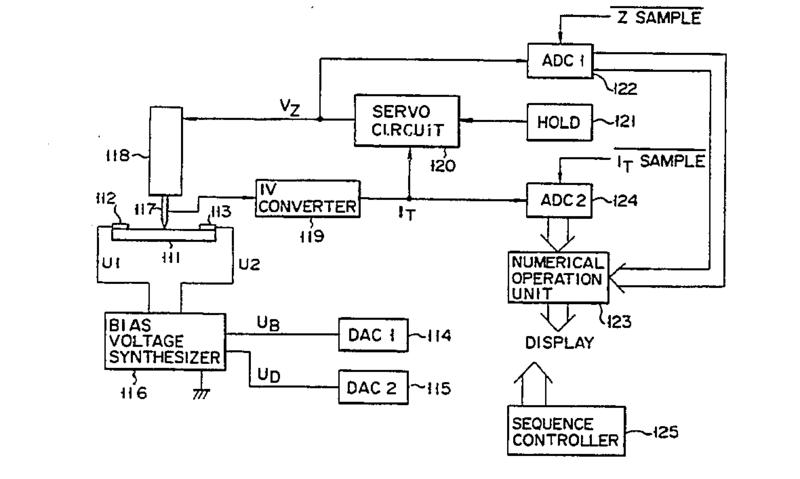 Electronic circuits or algorithms governing scanning. 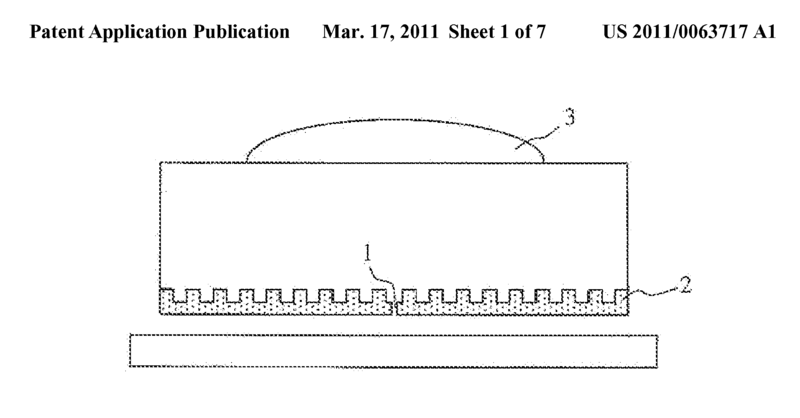 Illustrative example: US2008/0277582, Figure 6. Circuits or algorithms for driving the scanning probe during a scanning probe microscopy measurement, wherein the driving signal is adjusted during the measurement by using the detected signal coming from the interaction between the probe and the sample. In the case said circuits or algorithms belong to a specific kind of scanning probe microscope, the documents about them should be classified in the class pertinent to said particular kind of scanning probe microscope: e.g. 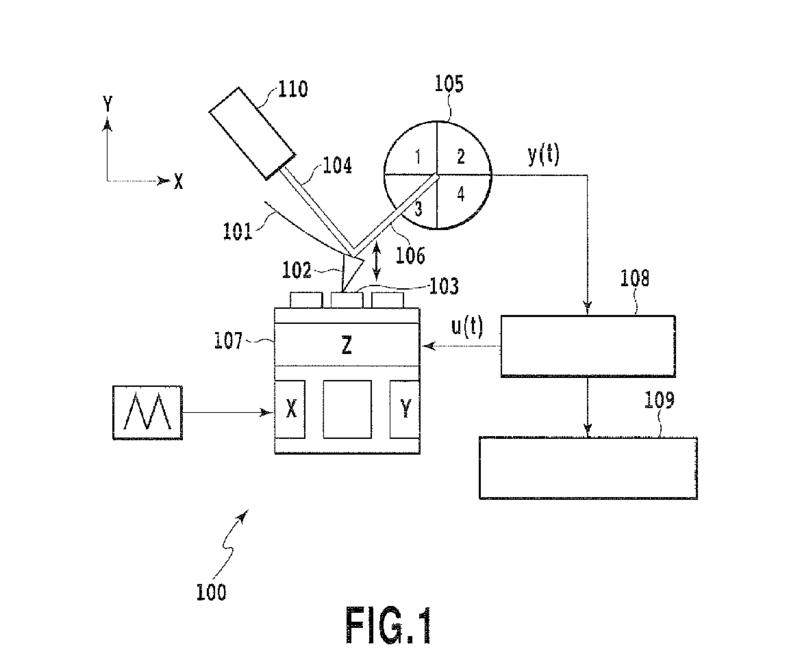 a tapping mode atomic force microscopy, wherein the detected signal is used to keep the oscillation frequency of an atomic force microscopy probe, i.e., a cantilever, at its resonance frequency, should be classified in G01Q 60/34. 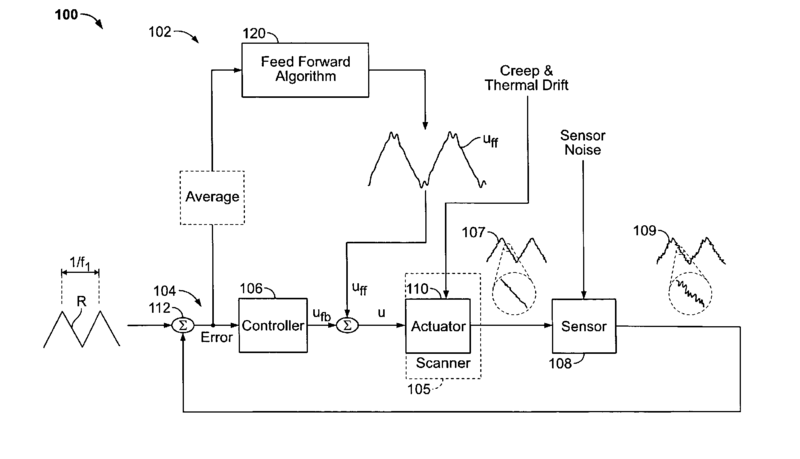 Methods or apparatus to monitor the movement of the probe. Monitoring the movement of the probe by means of light-sensitive/responsive devices. Probes comprising in their structure means for detecting a signal to control/monitor their movements, e.g. piezoelectric gauges. This group covers any kind of position-sensitive sensor integrated in the probe, like piezoresistive, capacitive, etc. 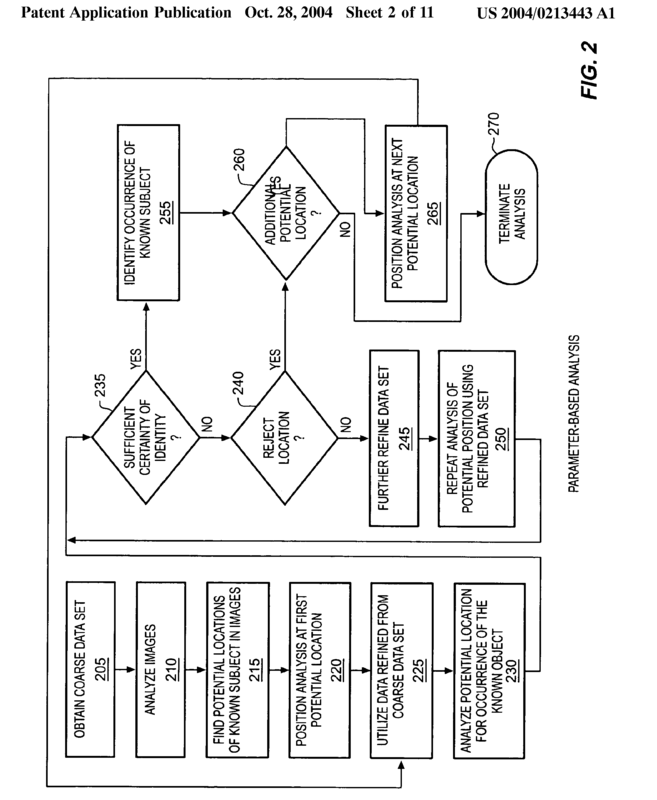 Devices or methods to assist or improve the analysis or investigation. An analysing or investigating device, different from a scanning probe microscope, for assisting or improving the master scanning probe techniques or apparatus. Illustrative example of subject matter classified in this group: DE4233399. 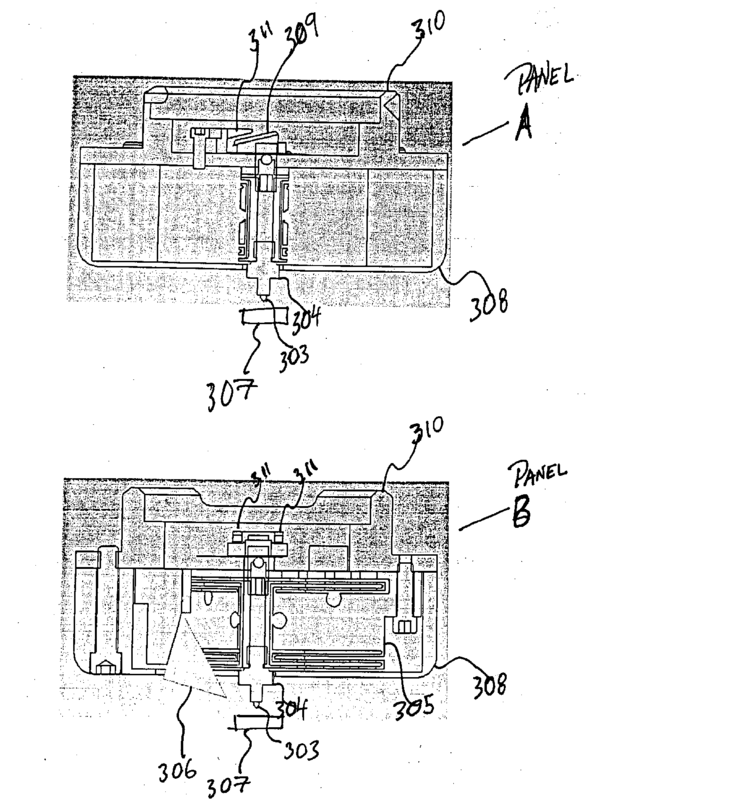 A programmable device that stores, retrieves, processes or displays data for assisting or improving the scanning probe techniques or apparatus. This subgroup covers computers, other programmable devices, mathematical models and mathematical methods and algorithms for data analysis. A programmable device wherein the data information is used to correct or fix the performance of the SPM. Means to adjust or control parameters, e.g. temperature, pressure or humidity, of a working environment condition inside the chamber containing the sample being studied. Means to adjust or control the temperature of the sample chamber, e.g. a cryostat or heater that allows SPM to be performed at low or high temperatures. Means to adjust or control parameters, e.g. pressure or compositions, of the fluid environment inside the sample chamber. The fluid environment can be in liquid or gas state. 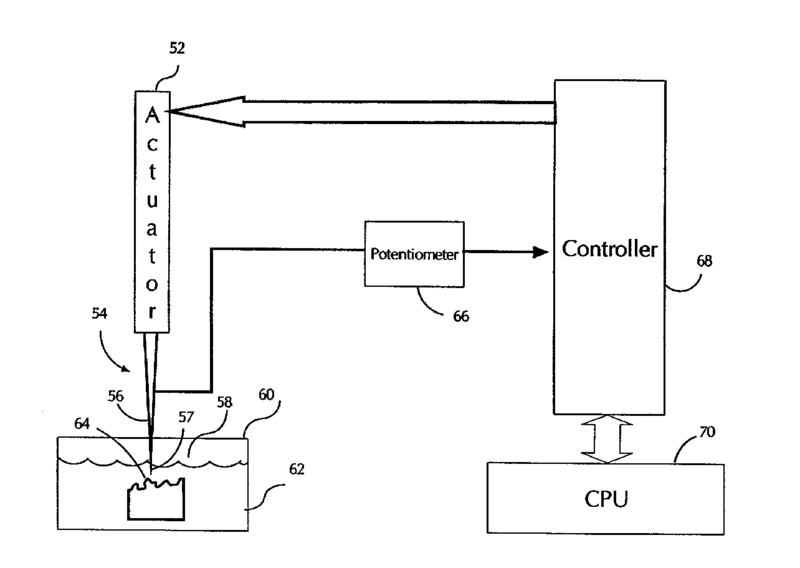 Means to adjust or control parameters of the liquid environment, e.g. water or other liquid chemical, inside the sample chamber. 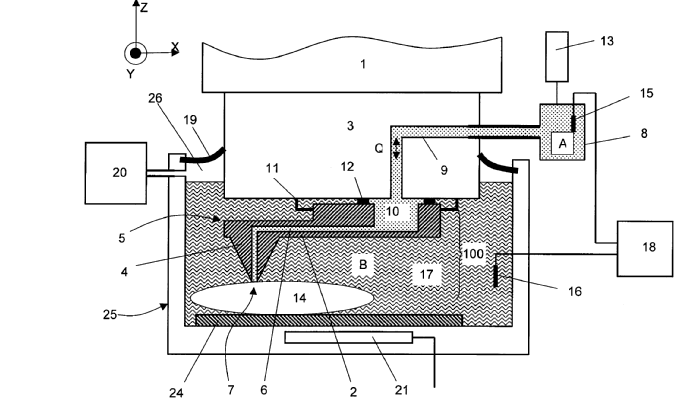 Means to adjust or control a vacuum condition inside the sample chamber, e.g. pumping means. 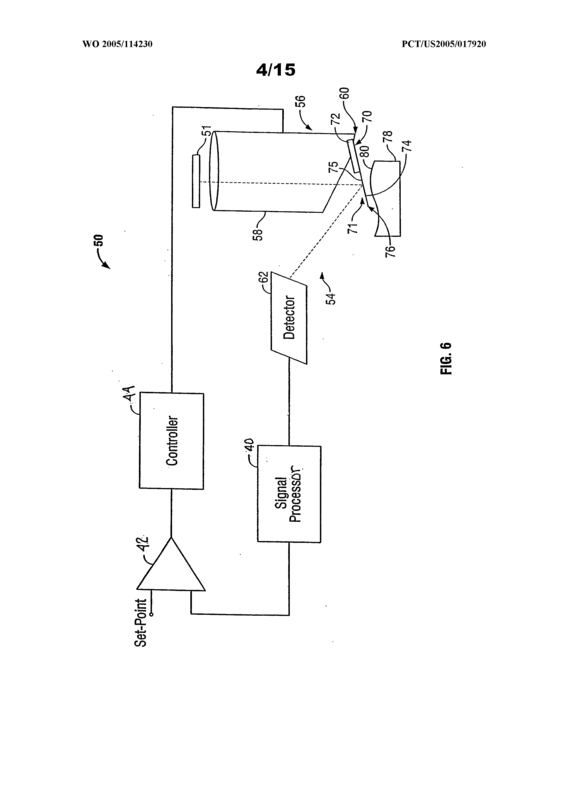 Means to prevent SPM from being disturbed by a condition outside the scanning probe microscope, e.g. vibration, temperature or pressure. The SPM is protected as a whole under the adverse condition. 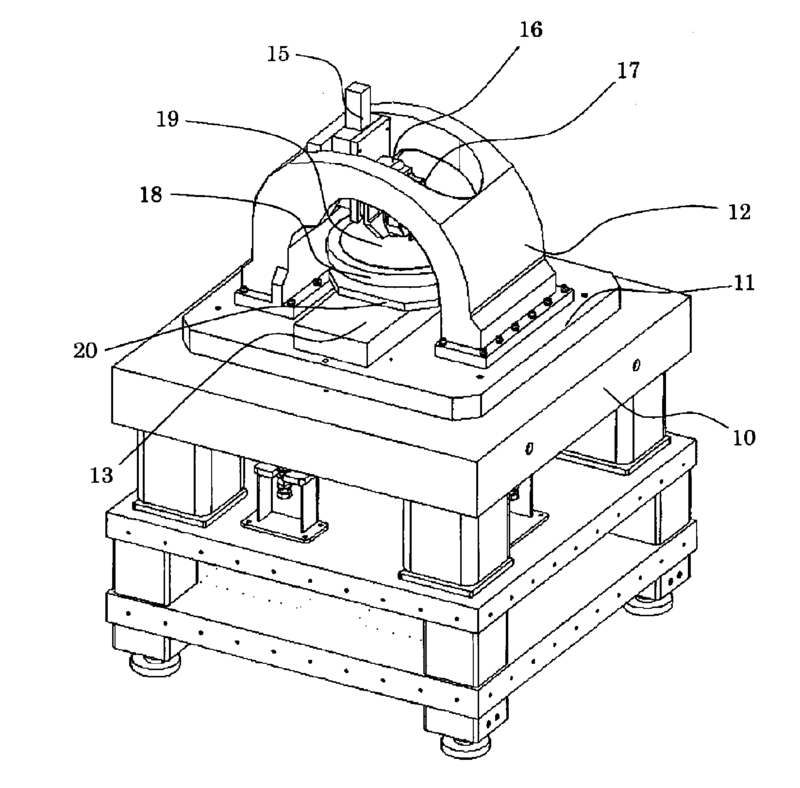 For example, a specific housing or arrangement to eliminate external vibrations to assure the stability of the microscope, or shielding that protects it from electromagnetic fields. 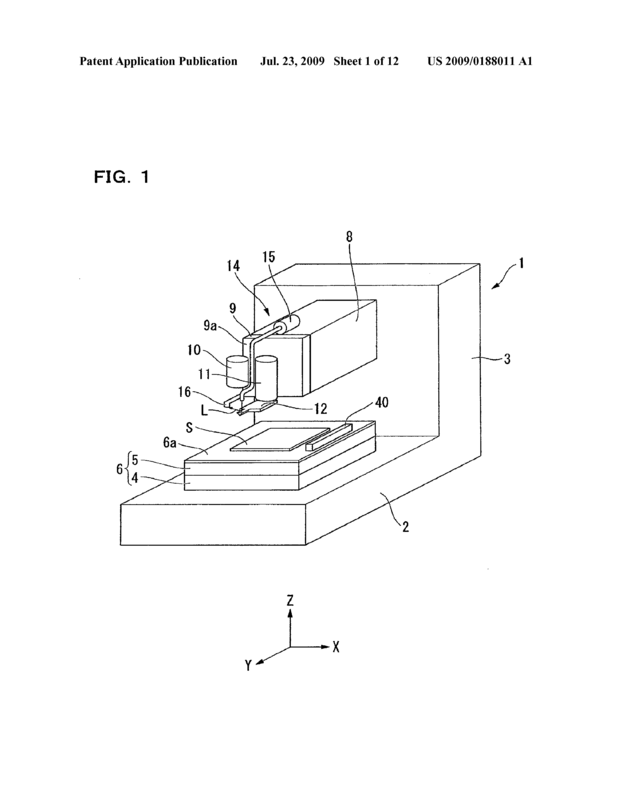 Methods or devices to perform mechanical operations on a sample in the scanning probe microscope for analysis or investigation, e.g. tweezers, cutting means. 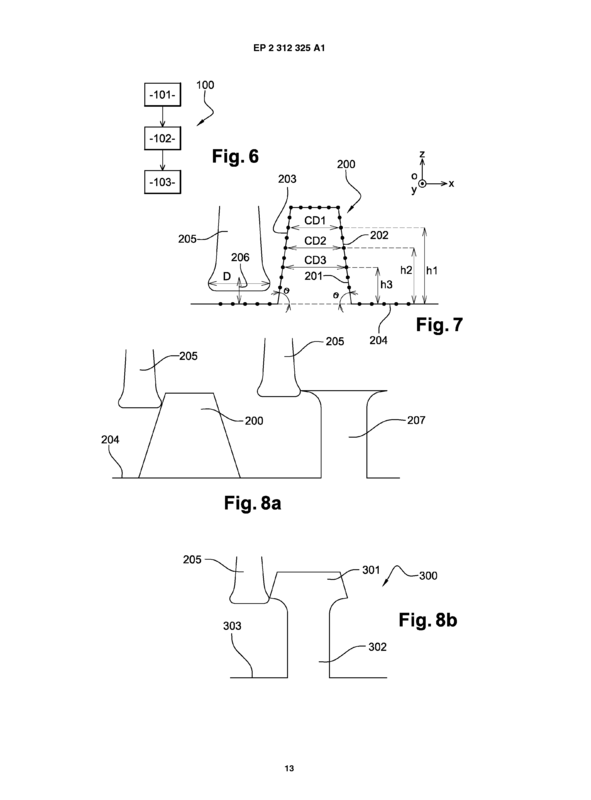 Methods or apparatus used to adjust or rectify a SPM device, e.g. the probe itself, to a desired standard. 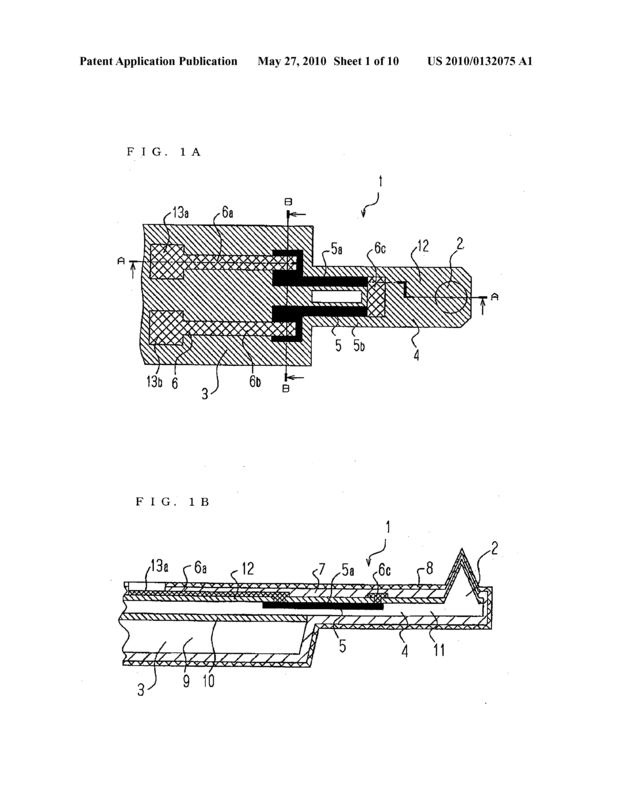 Structure with nanometric resolution used for correcting or fixing the performance of the SPM device before its utilization, e.g. 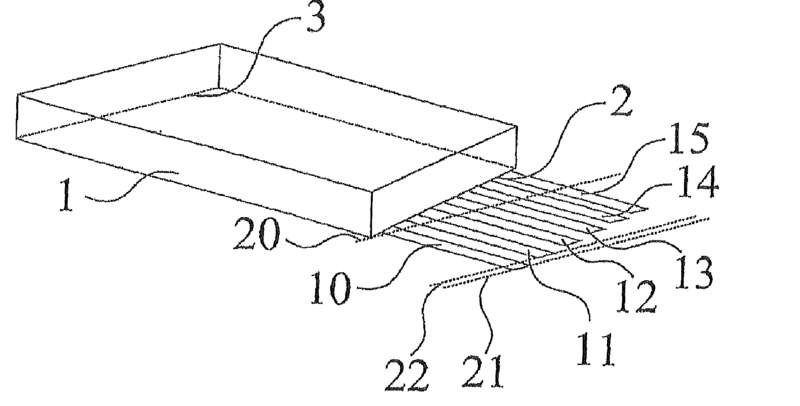 grating with a known line separation, and related manufacture. 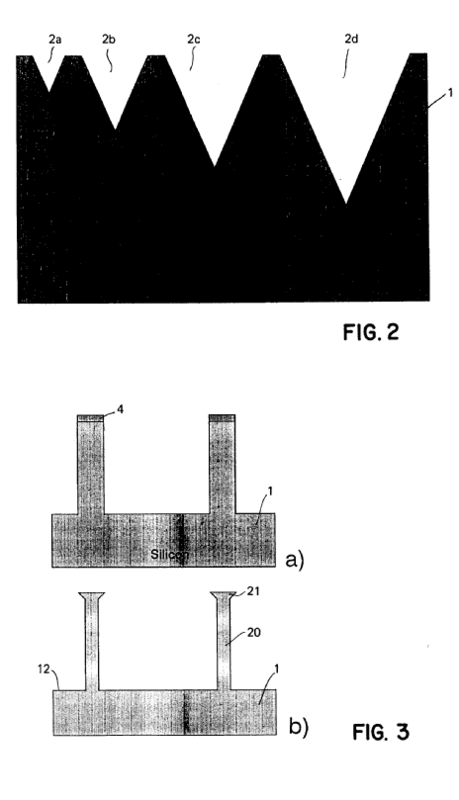 Methods or apparatus for which the type of interaction between the scanning probe tip and the sample surface is specified. 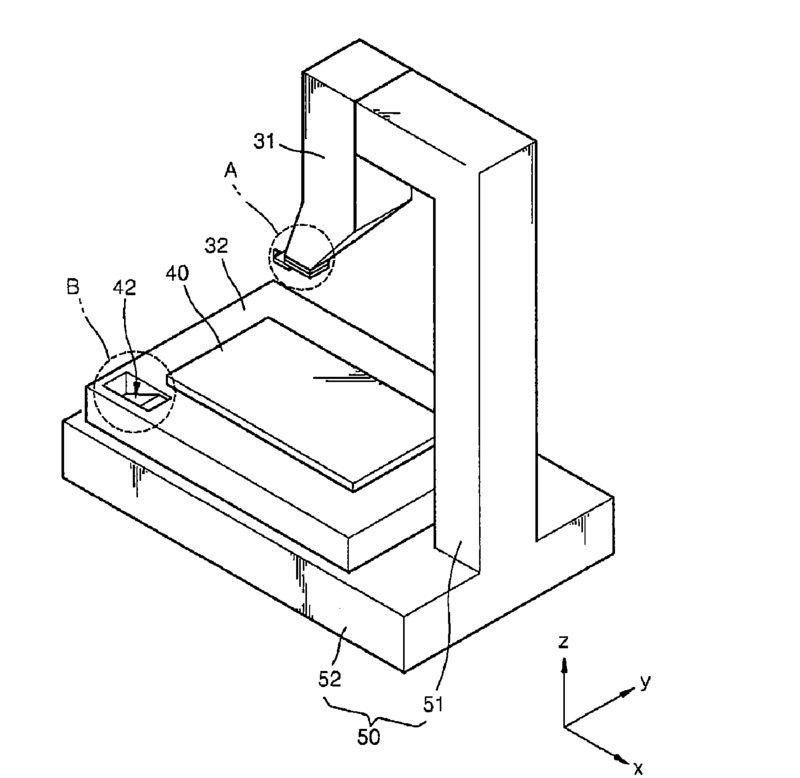 Methods or apparatus involving two or more different types of interactions between the scanning probe tip and the sample surface, e.g. 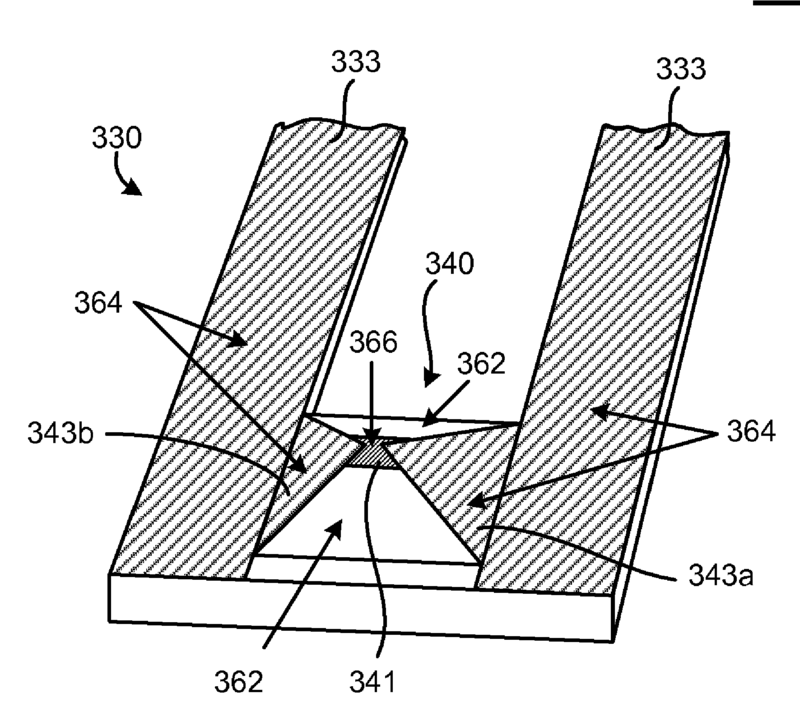 cantilever-type SPMs other than AFM which are explicitly built for AFM performances. The device can contain either one probe or more than one probe to perform different types of SPM over the sample. Methods or apparatus wherein the two monitored interactions are tunnelling current (STM) and the attractive or repulsive force between the probe and the sample surface (AFM). 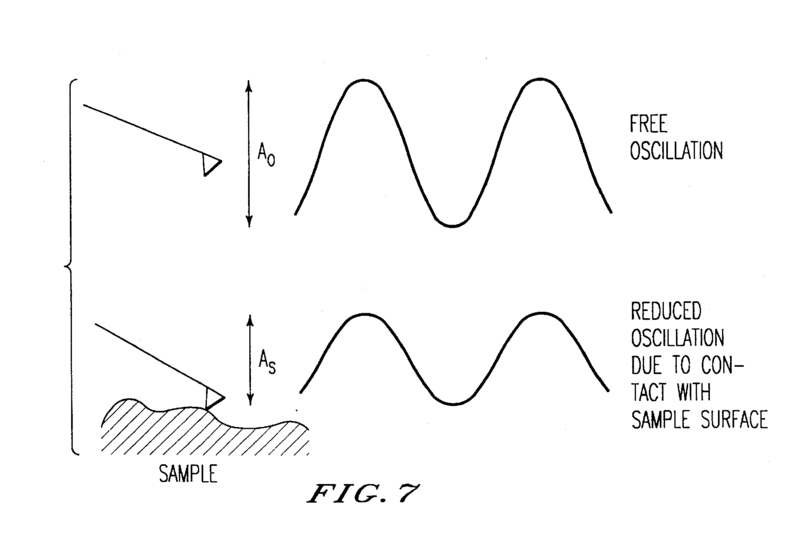 Methods or apparatus wherein the two monitored interactions are near-field light emitted from the sample surface (SNOM) and the attractive or repulsive force between the probe and the sample surface (AFM). 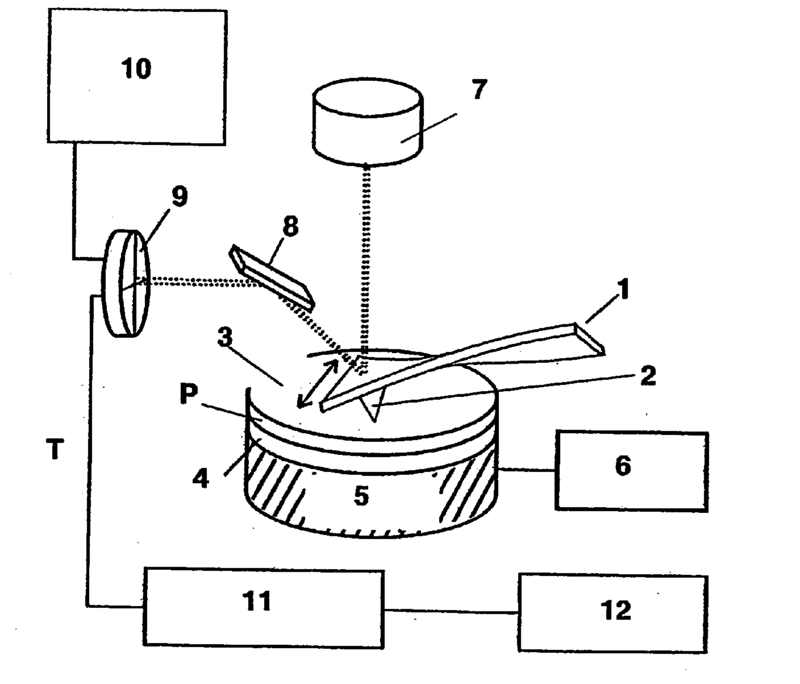 Methods or apparatus wherein the two monitored interactions are the magnetic force between the sample and the probe (MFM) and the attractive or repulsive force between the probe and the sample surface (AFM). 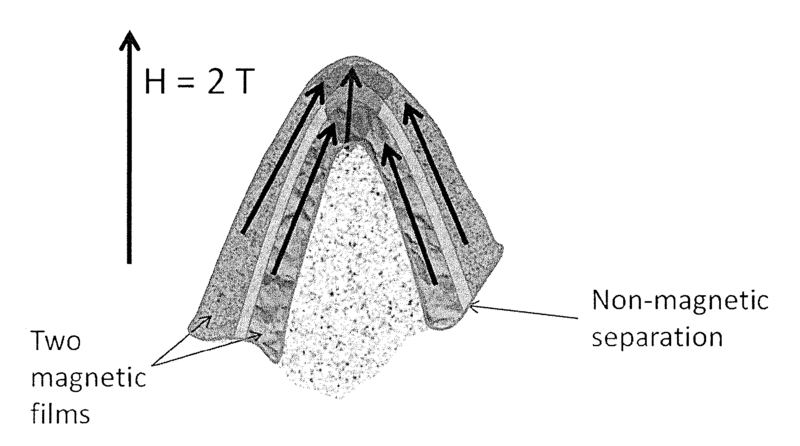 Methods or apparatus for SPM wherein the monitored interaction is the tunnelling current between the tip and the sample, which are in very close proximity but not actually in physical contact. STM or apparatus therefor wherein the local electronic state of surface is analysed or investigated. STM or apparatus therefor wherein the electric potential distribution on the sample is analysed or investigated. 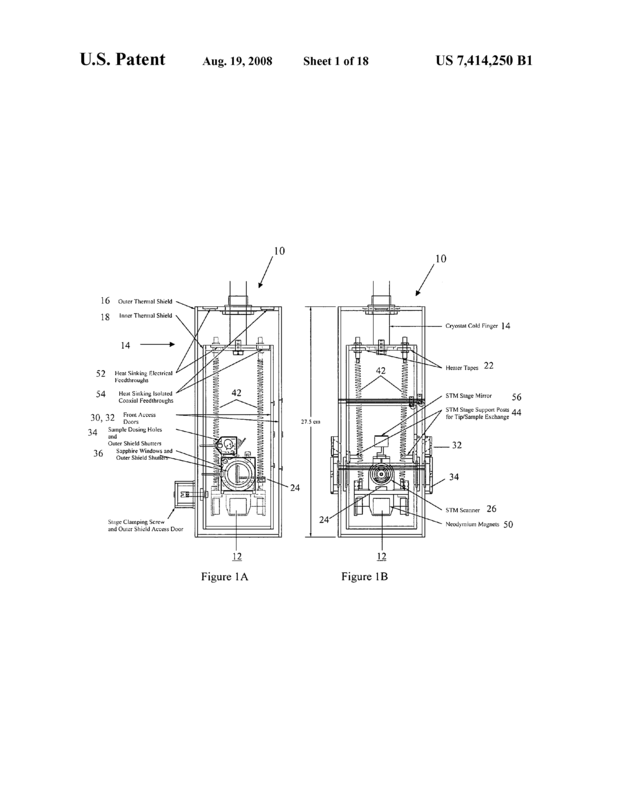 STM probes, their manufacture, or related instrumentation, e.g. holders. Methods or apparatus for SPM wherein the monitored interaction is the near-field light emitted or reflected from the object surface. 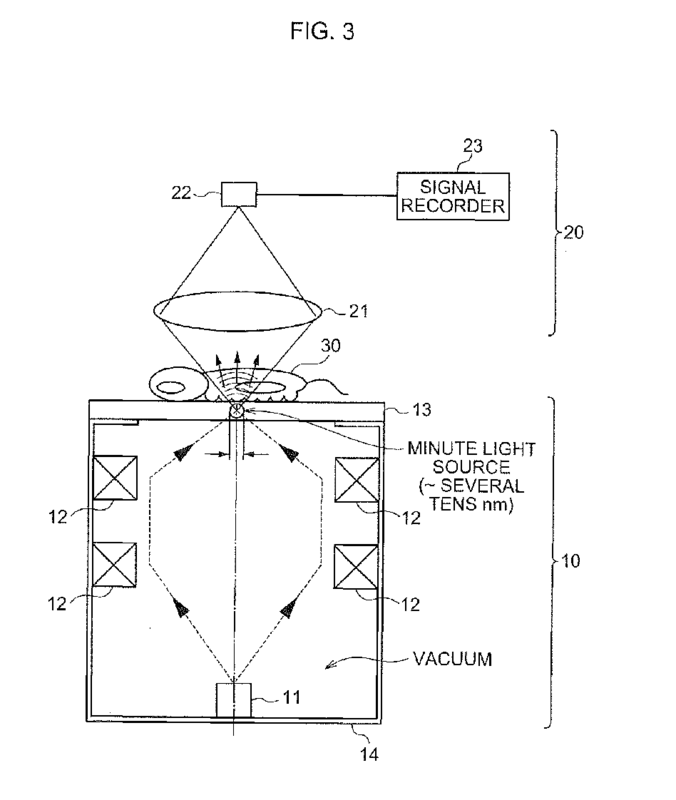 SNOM or apparatus therefor wherein the near-field light to be monitored is the emission radiation from a sample surface excited by an electromagnetic wave. 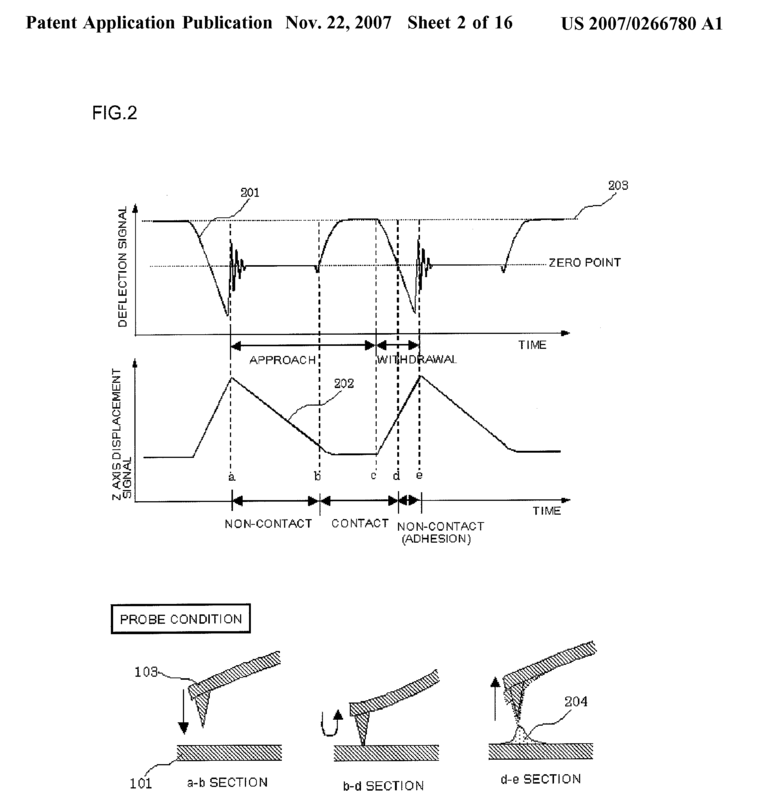 SNOM probes, their manufacture or related instrumentation, e.g. holders. Methods or apparatus for SPM wherein the monitored interaction is the short range repulsive or long range attractive force between the probe and atoms of the sample surface. 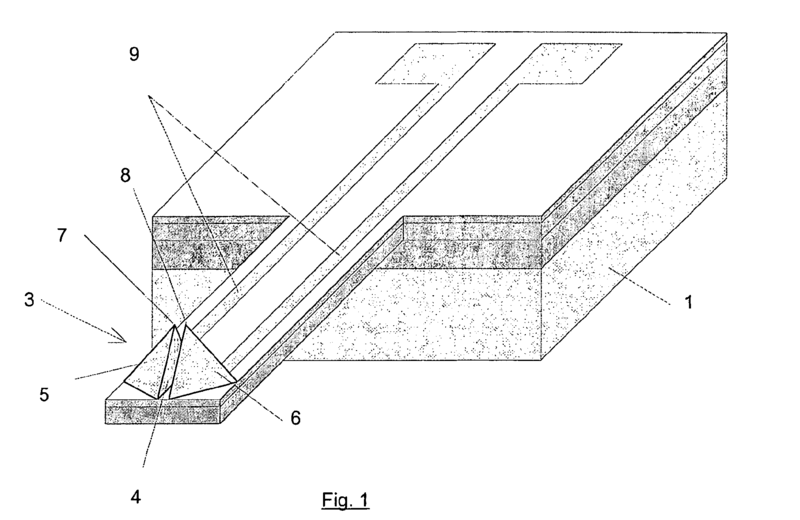 AFM or apparatus therefor wherein the force monitored is the shear force between the probe and atoms of the sample surface. AFM or apparatus therefor wherein the force monitored is the adhesion force that tends to keep the probe in contact with the sample surface. 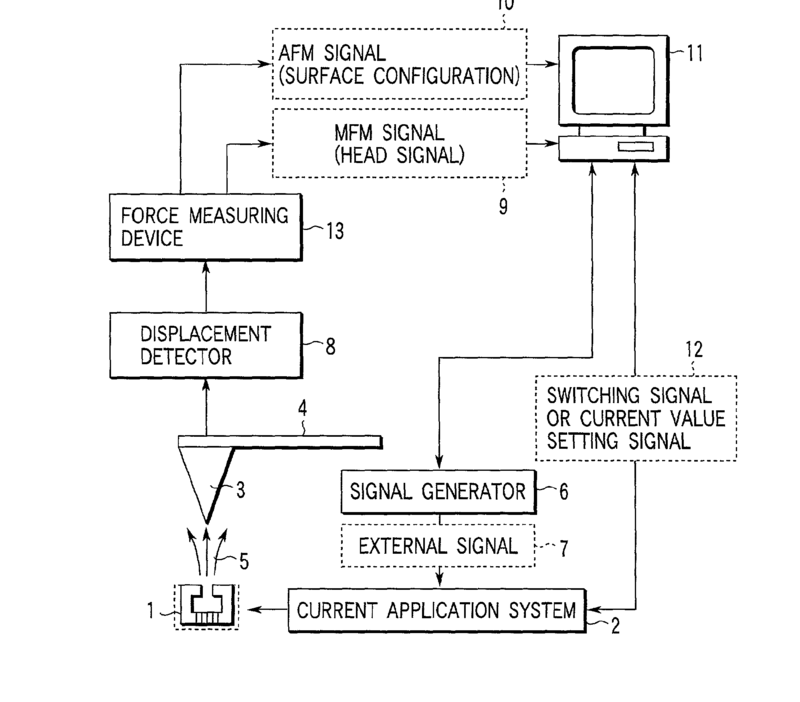 AFM or apparatus therefor wherein the force monitored is an electric interaction affected by the electric potential distribution on the sample surface, e.g. Kelvin probe microscopy and Scanning Maxwell stress microscopy. Also probes for this kind of microscopes are classified here. 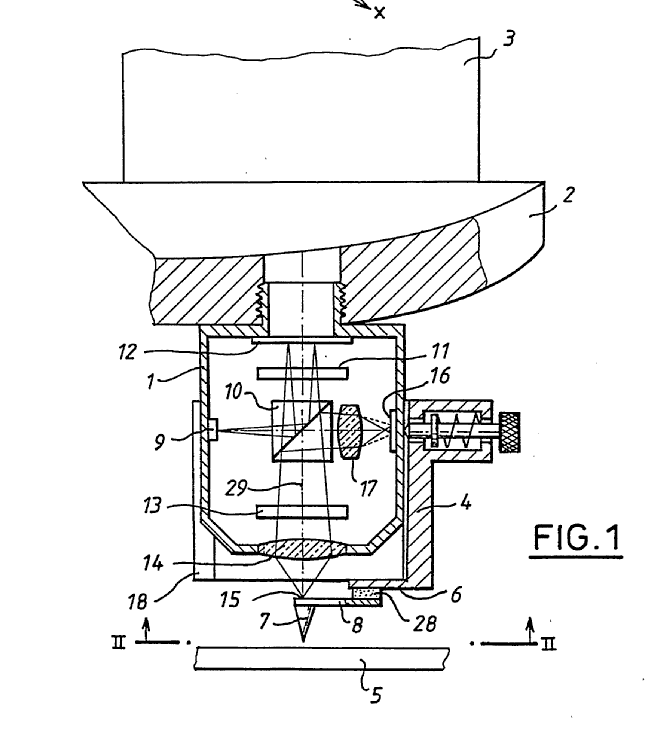 AFM or apparatus therefor wherein the probe is a vibrating cantilever, or is mounted on a vibrating cantilever. 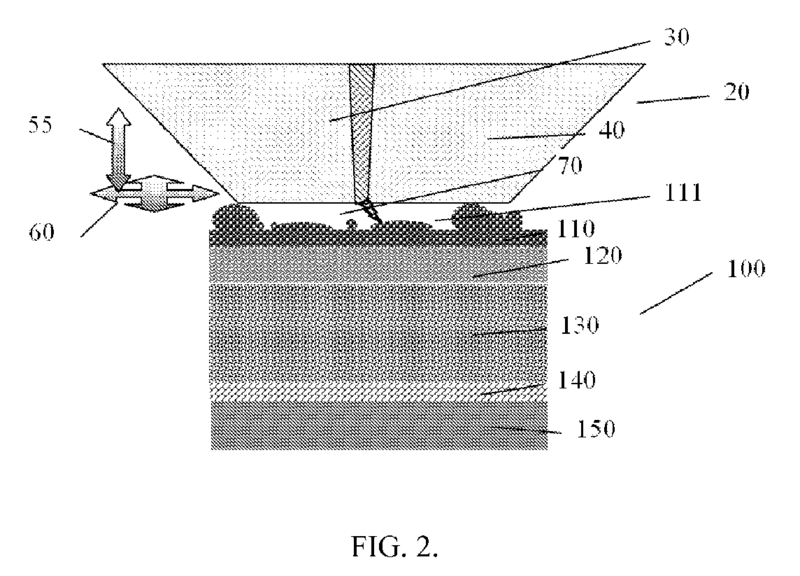 AFM or apparatus therefor wherein tip of probe touches periodically the sample surface. 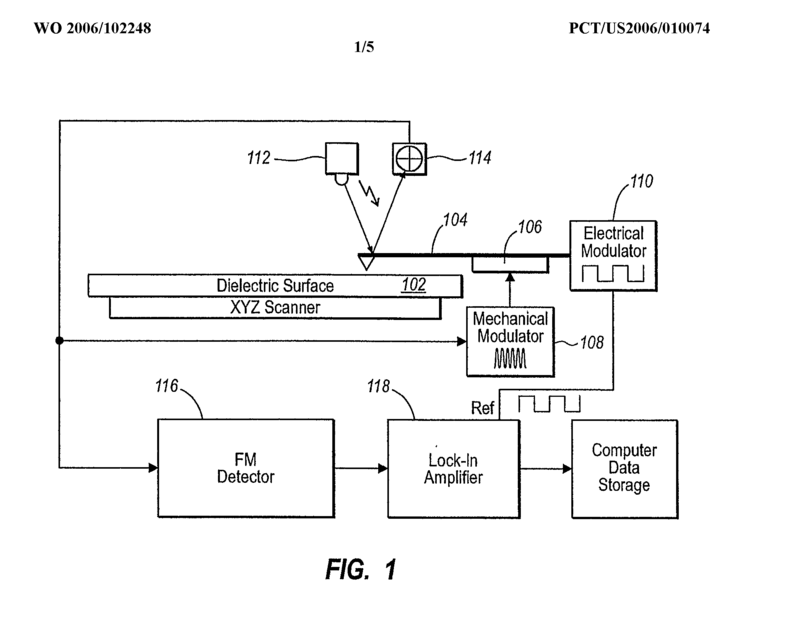 AFM or apparatus therefor wherein the probe is, or is mounted on, a static (i.e. vibrationless) cantilever. AFM wherein the probe is always in contact with the surface. 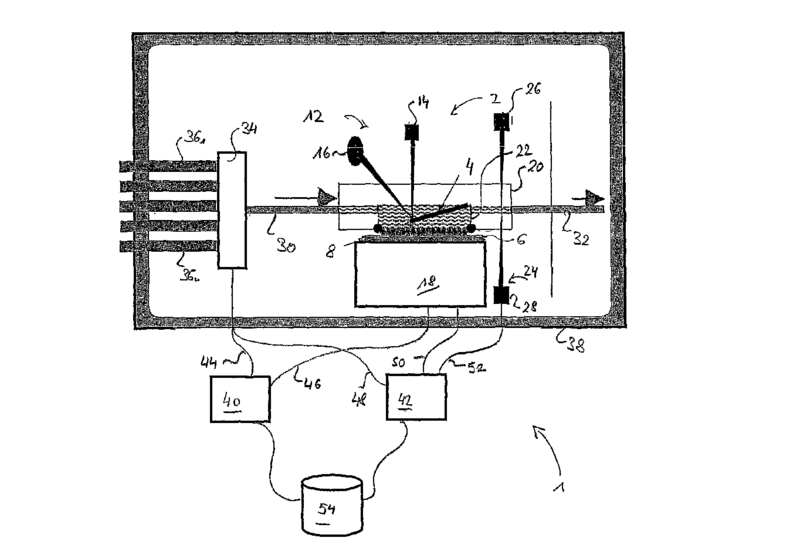 Device for measuring indenting force into a surface using SPM probes. 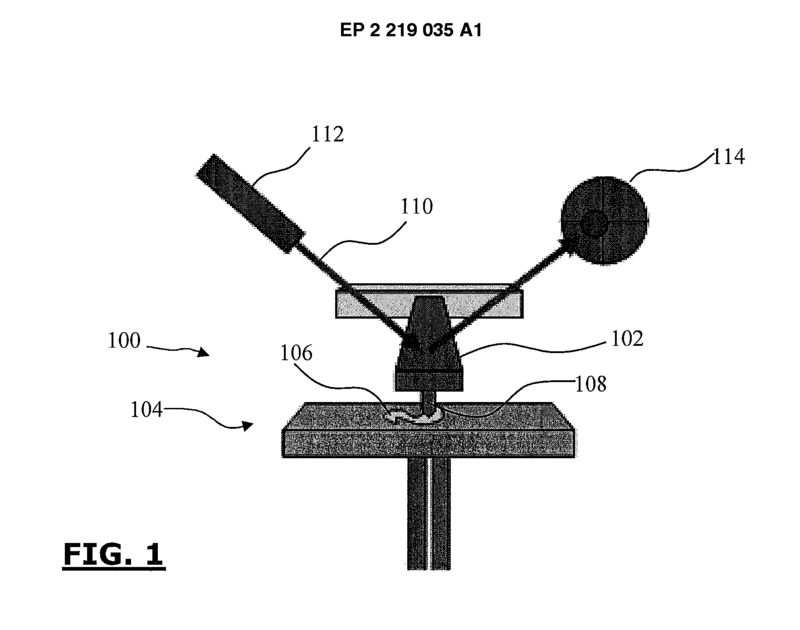 AFM probes, their manufacture, or their related instrumentation, e.g. holders. Probes for AFM for special applications, like, e.g., tapping mode AFM, Kelvin Force microscopes, etc. are to be classified also in the corresponding groups. Special shapes or processes for manufacture are classified in this group. AFM probe that is made of a material that conducts electric charges. 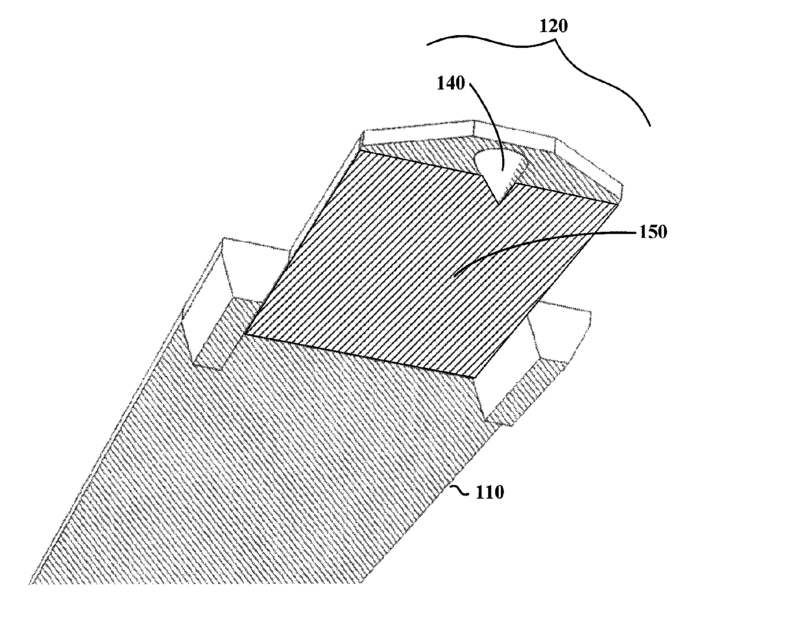 AFM or apparatus therefor wherein specific particles are added to the tip to give it another characteristic, e.g. specific chemical receptor for biochemical analysis. Methods or apparatus for SPM wherein the monitored interaction is the ion flow between the probe tip and the sample surface. Methods or apparatus for SPM wherein the monitored interaction is the electrical capacity between the probe tip and the sample surface. 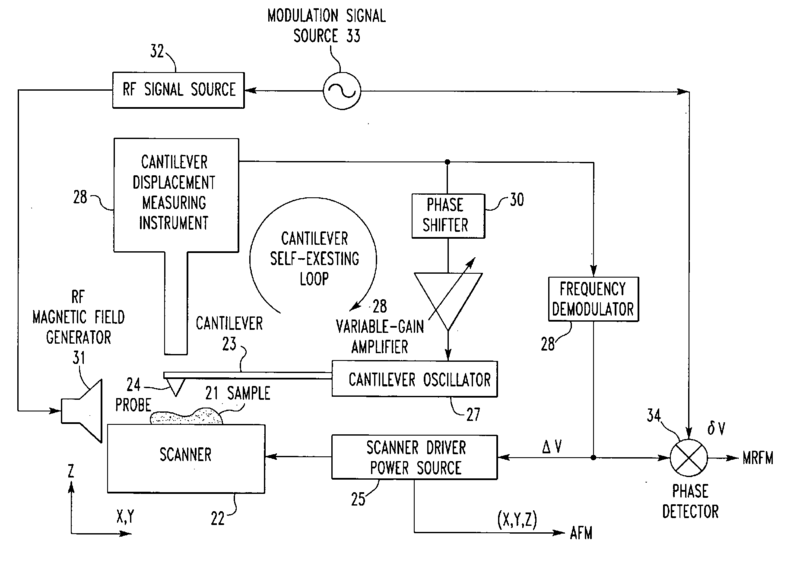 SCM probes, their manufacture, or their related instrumentation, e.g. holders. 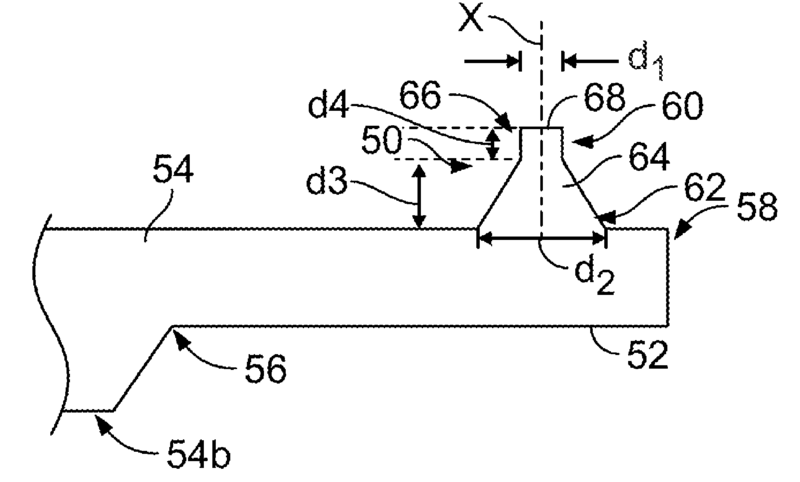 Methods or apparatus for SPM wherein the monitored interaction is the magnetic force between the probe tip and the sample surface. MFM or apparatus therefor wherein a spin magnetic moment is induced by a specific magnetic field frequency. 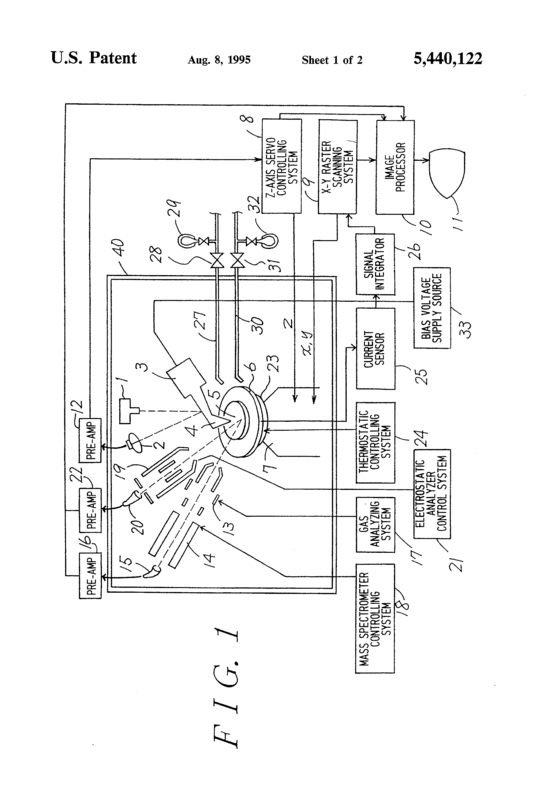 MFM probes, their manufacture, or their related instrumentation, e.g. holders. MFM probe tips that are coated with some material with specific magnetic property. 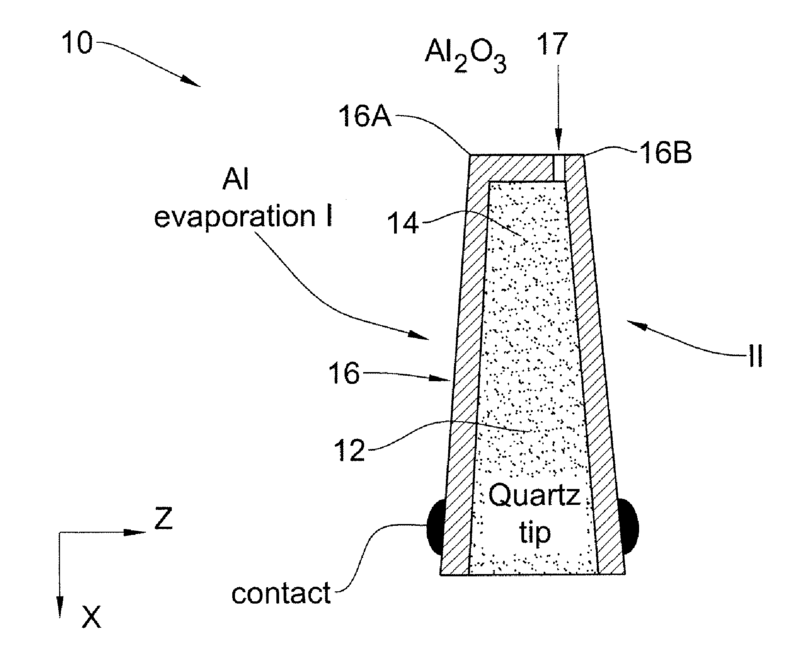 Methods or apparatus for SPM wherein the monitored interaction is the heat or temperature of the sample surface. Methods or apparatus for SPM wherein the monitored interaction is the Faraday current generated by an electrochemical reaction. 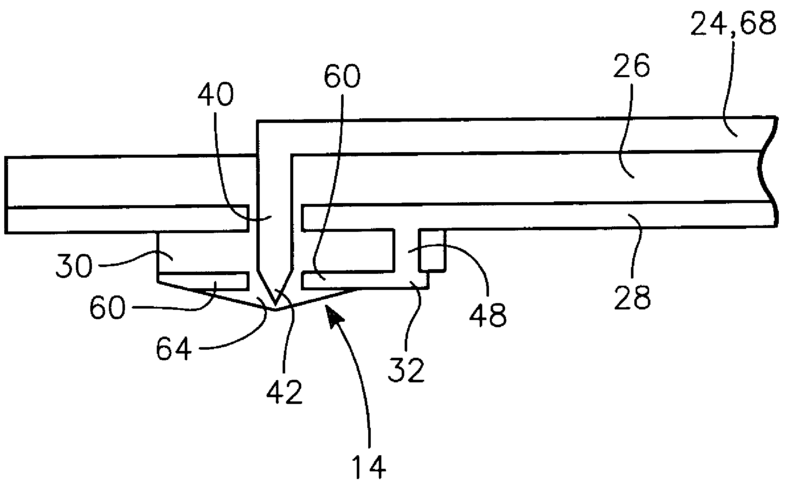 General aspects of SPM probes, their manufacture or their related instrumentation, insofar as these probes are not specially adapted to a single particular type of SPM technique covered by group G01Q 60/00 and subgroups. 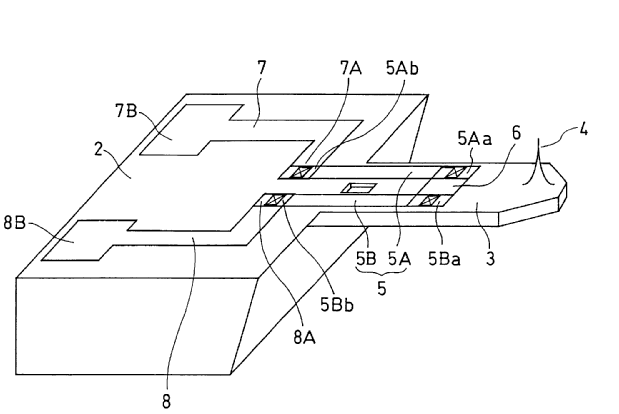 General aspects of SPM probe holders. General SPM probe holders with integrated means to adjust the probe to correct for errors caused by temperature variations or vibrations. General SPM probes wherein multiple tips of similar characteristics form a line or a matrix. Specific characteristics of general SPM probes. Specific characteristics like shape, material, etc. are covered by the subgroups G01Q 70/10 - G01Q 70/14. Specific physical form, degree of slope or angle of the tip in a general SPM probe. With "probe" both tip and cantilever are meant. 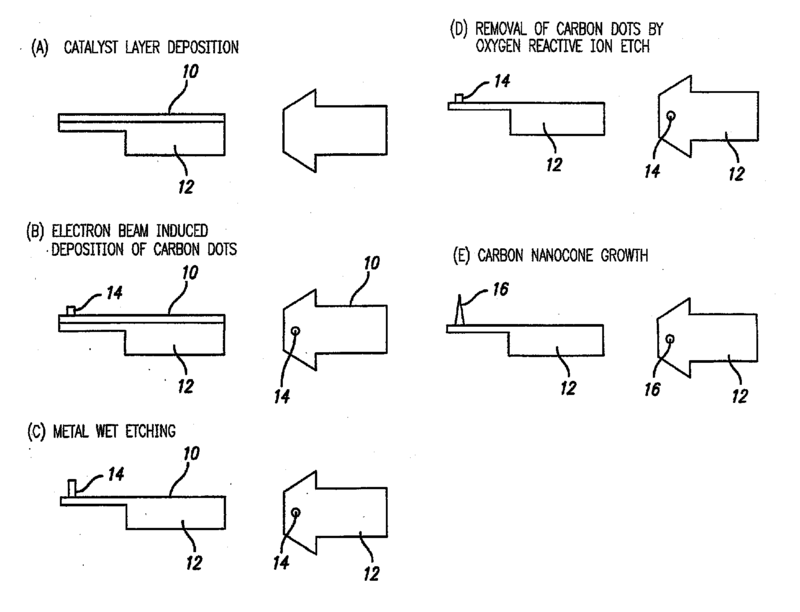 General SPM probes having a nanosized tube such as Carbon nanotube. Specific choice of materials for general SPM probes or components thereof. For example, where a cantilever or a coating on the tip is made of some material that gives a particular property to the scanning probe. 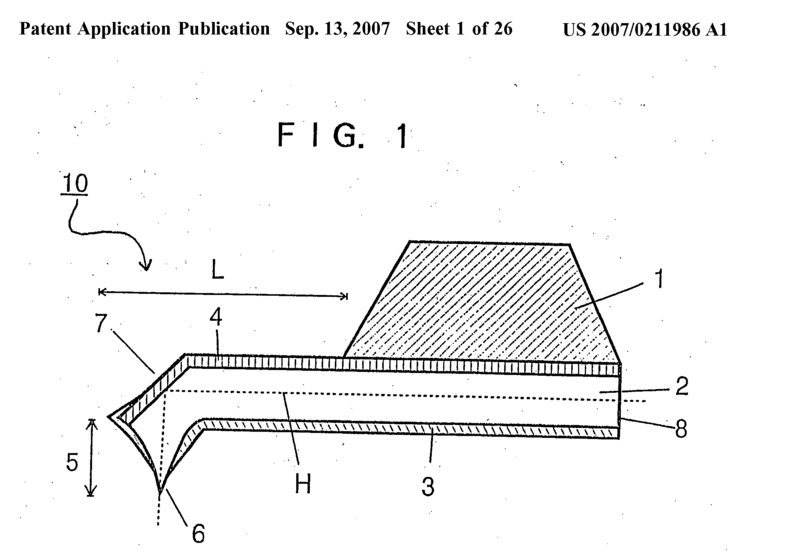 Materials of cantilever and/or tip. 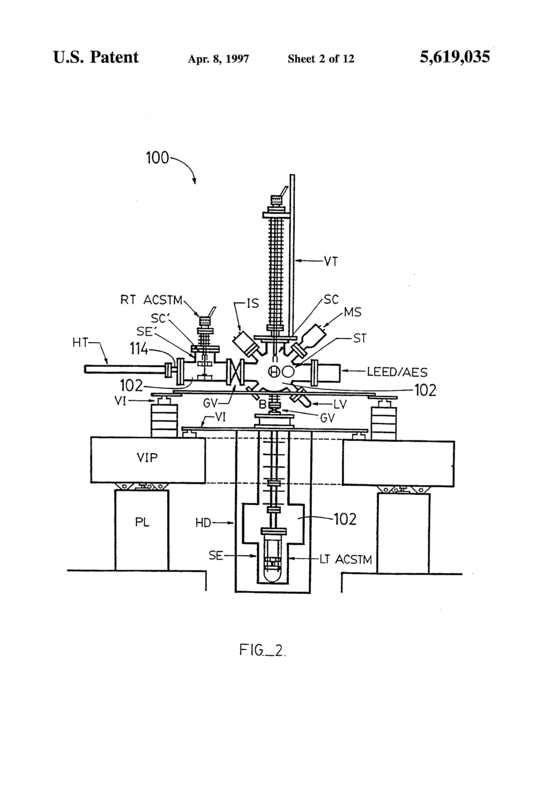 Manufacture aspects of general SPM probes. Manufacture of probes for particular kinds of SPM (e.g. AFM, STM, SNOM) are classified in the corresponding G01Q 60/00 subgroup. General SPM probes, wherein specific particles are added to the tip to give it another characteristic, e.g. 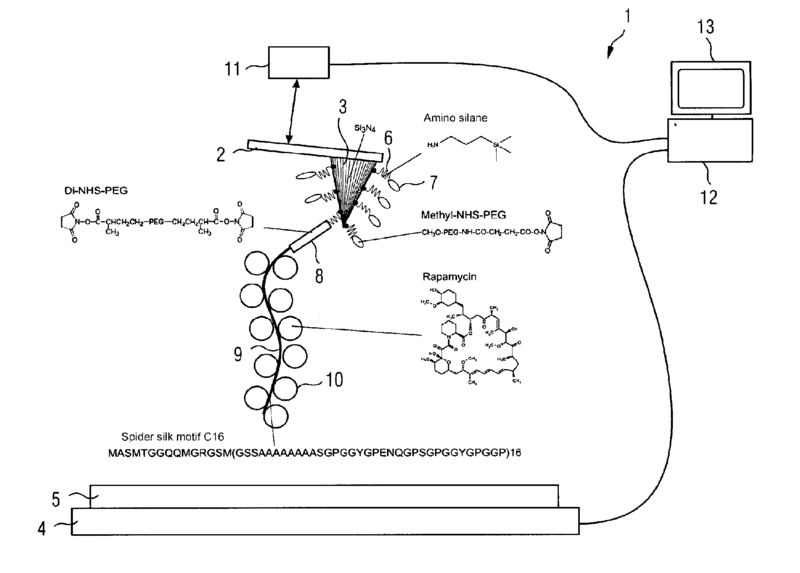 specific chemical receptor for biochemical analysis. Specific applications, different from SPM, of scanning-probe techniques.